1. an object or substance that controls the rate at which a certain phenomenon occurs. 3. in biochemistry, a substance whose rate of reaction sets the pace for a series of interrelated reactions. artificial pacemaker an electronic cardiac pacemaker that has a pulse generator to generate an extrinsic electrical impulse, causing the heart muscle to depolarize and then contract; its rate is preset regardless of the heart's intrinsic activity. It can be either temporary (transcutaneous, transvenous, or epicardial) or implanted. asynchronous pacemaker an implanted pacemaker that delivers stimuli at a fixed rate, independent of any atrial or ventricular activity; this type is now rarely used except to initiate or terminate some tachycardias. AV sequential pacemaker an implanted pacemaker with dual chamber pacing that maintains the atrial part of ventricular filling by stimulating the atrium if it does not respond at the proper interval after ventricular activity; used for patients with abnormal sinus node function or decreased atrioventricular conduction. cardiac pacemaker a small mass of specialized muscle tissue in the heart that sets a rhythm of contraction and relaxation for the other parts of the heart, resulting in the heartbeat. Usually the pacemaker site is the sinoatrial node, near the junction with the superior vena cava. The normal rhythm, 60 to 100 contractions per minute, increases during physical or emotional stress and decreases during rest. The pace varies from person to person and is affected by abnormal conditions such as heart injuries and generalized infections. If the normal pacemaker fails to function, its regulating task may be taken over by another small mass of special muscular tissue, the atrioventricular node. DDD pacemaker dual chamber pacemaker. demand pacemaker an artificial pacemaker that activates only when it receives sensations indicating a lack of adequate spontaneous rhythm by the heart. It thus avoids competition with the patient's own natural pacemaker. dual chamber pacemaker an implanted pacemaker having two leads, one in the atrium and one in the ventricle, so that electromechanical synchrony between the chambers can be approximated. Called also DDD pacemaker. A dual chamber pacemaker senses and paces in both the atrium and the ventricle. ectopic pacemaker any biological cardiac pacemaker other than the sinoatrial node; under normal conditions it is not active. epicardial pacemaker a temporary pacemaker whose leads are attached to the epicardial surface; usually used in the diagnosis and treatment of postoperative dysrhythmias. 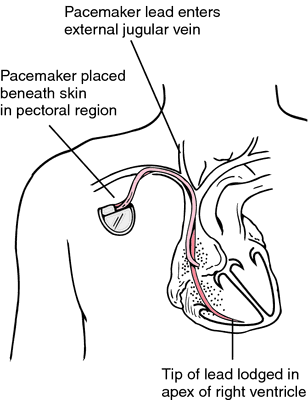 escape pacemaker an ectopic pacemaker that assumes control of cardiac impulse propagation because of failure of the sinoatrial node to generate one or more normal impulses. external pacemaker an artificial pacemaker located outside the body; the primary types are transcutaneous and transvenous. See also temporary pacemaker. gastric pacemaker a saddle-shaped area of the greater curvature of the stomach at the junction of its proximal and middle thirds, which regulates the frequency of gastric contractions. implantable pacemaker (implanted pacemaker) an artificial pacemaker implanted within the body. phrenic pacemaker the device used in electrophrenic respiration; it converts radiofrequency signals into electrical impulses that stimulate the phrenic nerve, resulting in descent and flattening of the diaphragm and improved inhalation of air. Called also diaphragmatic pacemaker. synchronous pacemaker an implanted pacemaker that synchronizes the physiological events in the atrium with those of the ventricle; it stimulates the ventricle when triggered by the P wave from the atrium. temporary pacemaker an artificial pacemaker in which the pulse generator is not implanted, usually either a transcutaneous or transvenous pacemaker. See also external pacemaker. transcutaneous pacemaker a temporary pacemaker in which large surface, high impedance electrodes are applied to the anterior and posterior chest walls to deliver high current stimuli of long duration for pacing of the ventricles. transvenous pacemaker an artificial pacemaker, either external or implanted, that is connected to the heart by pacing leads passed through the venous circulation to make contact with the endocardium of the right atrium or right ventricle. uterine pacemaker either of the two regulating centers that control uterine contractions, located near the openings of the fallopian tubes. When the fetus is ready to be born the pacemakers set off a series of rhythmic contractions in the uterine muscle that gradually force the infant out into the birth canal. wandering pacemaker a condition in which the site of origin of the impulses controlling the heart rate shifts from the head of the sinoatrial node to a lower part of the node or to another part of the atrium. a disturbance of the normal cardiac rhythm in which the site of the controlling pacemaker shifts from beat to beat, usually between the sinus and AV nodes, often with gradual sequential changes in P waves between upright and inverted in a given ECG lead. A term of art referring to an intermittent shift—or suppression—of one cardiac pacemaker, usually from the sinus node to another, often the AV node. The contraction gradually increases in length of the cycle, and is usually an innocuous finding in infants. Wandering pacemakers may reflect fluctuating vagal tone. A disturbance of the normal cardiac rhythm in which the site of the controlling pacemaker shifts from beat to beat, usually between the sinus and atrioventricular nodes, often with gradual sequential changes in P waves between upright and inverted in a given electrocardiographic lead. 1. an object or substance that controls the rate at which a certain phenomenon occurs; often used alone to indicate an artificial cardiac pacemaker; however, there are other natural and artificial pacemakers. 2. In biochemistry, a pacemaker is a substance whose rate of reaction sets the pace for a series of interrelated reactions. (1) an implanted cardiac pacemaker in which the induced ventricular rhythm is independent of the atrium; it is usually set at a fixed rate of ventricular stimulation. (1) cells within the heart capable of spontaneous discharge. (1) a saddle-shaped area of the greater curvature of the stomach at the junction of its proximal and middle thirds, which regulates the frequency of gastric contractions. (1) a device designed to facilitate respiration by converting radiofrequency signals into electrical impulses that stimulate the phrenic nerve, resulting in contraction and flattening of the diaphragm and improved inspiration of air. implantation of a pacemaker device in animals usually for the treatment of symptomatic bradyarrhythmias. falling arterial pressure, low cardiac output and congestive heart failure, usually due to a suboptimal pacing mode. either of the two regulating centers that control uterine contractions. a condition in which the site of origin of the impulses controlling the heart rate shifts from the head of the sinoatrial node to a lower part of the node or to another part of the atrium.